So Tuesday is here again and although I just posted the view last week it would be a shame to ignore the irises which have come along since then. 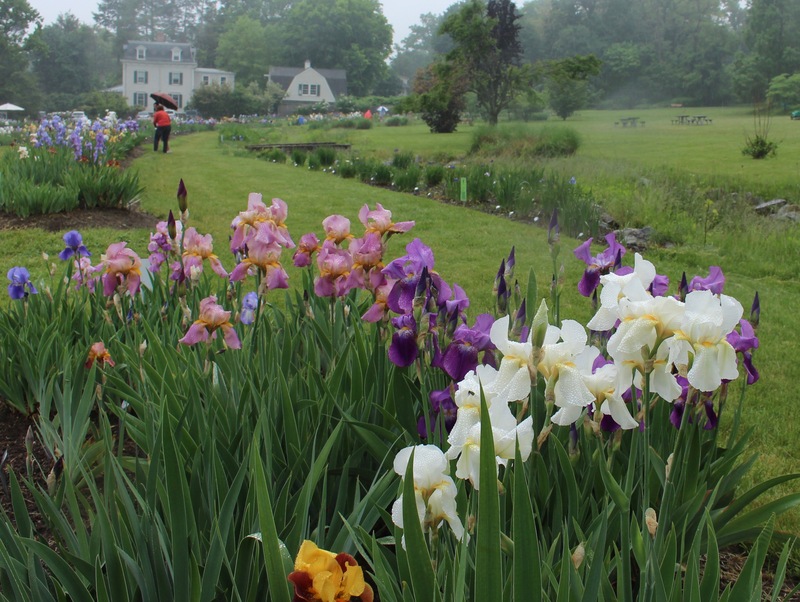 The Tuesday view showing the beginning of iris season. Still lots of green but the iris are peaking! 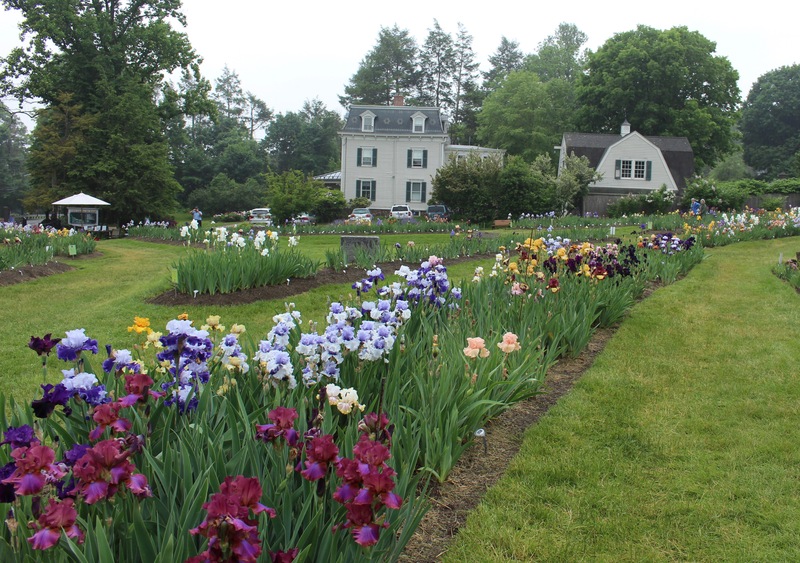 Bearded iris are a favorite, and the older “historic” types just beg to be planted en masse in this full sun, often dry, and always exposed, location. There’s little I have to do for them other than give them a little attention in June when I remove the spent flower stalks and pull up any borer infested plants I find. The view from the other end. For now iris ‘ambassadeur’ is center stage, but will soon be swamped by the variegated arundo donax grass which is only just beginning to sprout. 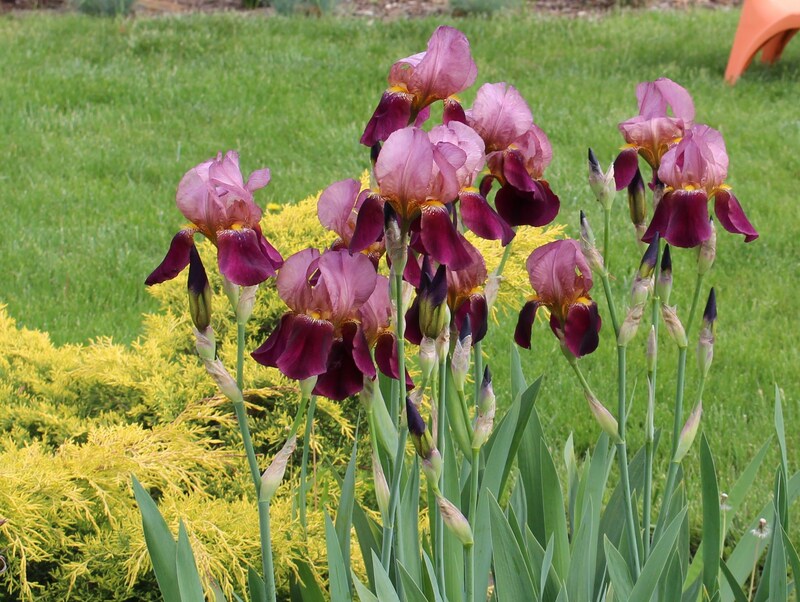 Besides the color these older iris also are also very generous with their lemony and grape fragrances. 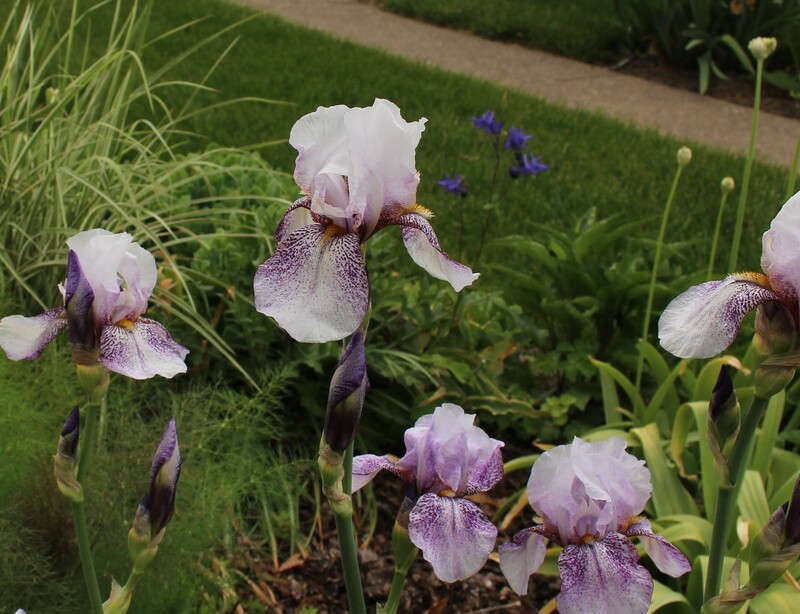 My favorite is this bitoned iris which was growing in my parent’s garden when they bought their first (and current) house back in the 70’s. 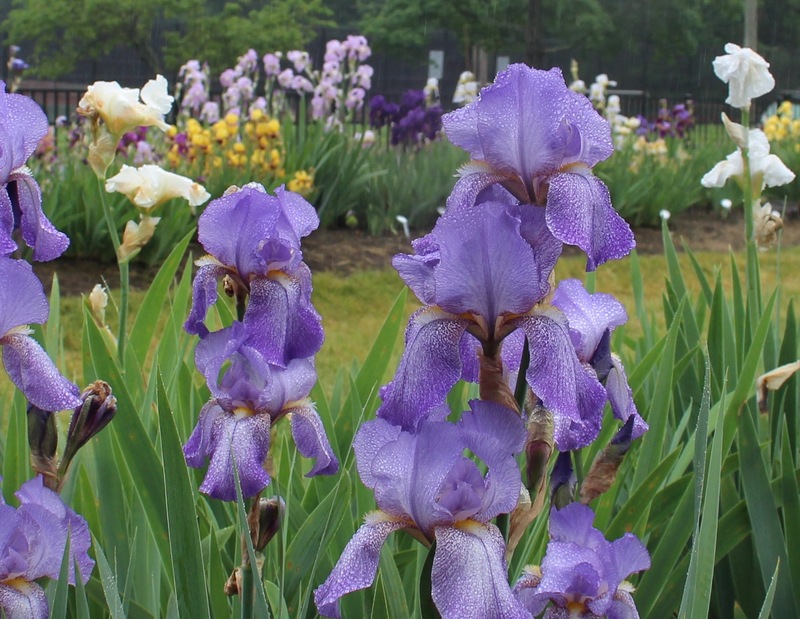 After years of wondering, this spring I am officially naming it ‘Folkwang’, a German iris introduced in 1925 by the nursery of Goos & Koenemann. 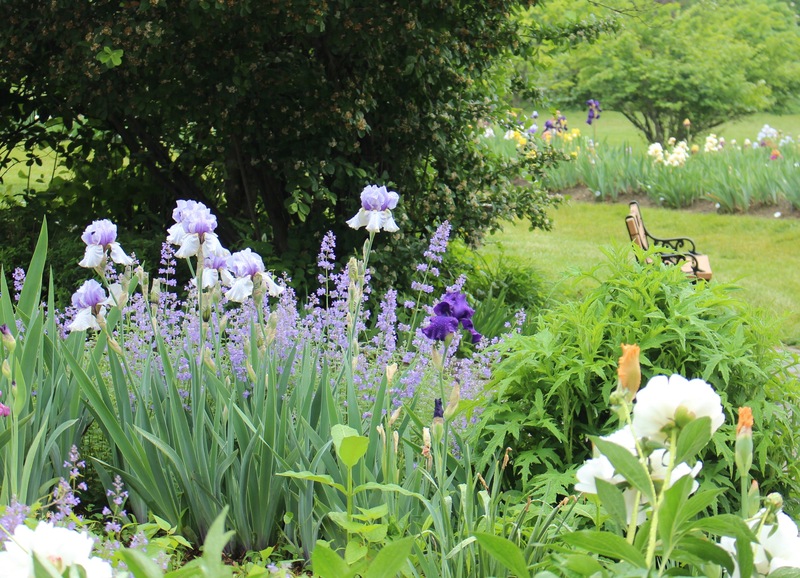 My newly named iris ‘Folkwang’ plus a lonely little lupine and a few alliums. To search for a name for years may be a little obsessive, but it’s not like I was at it 24/7. A little looking here, a little looking there until finally I found one which really looked close. To seal the deal I searched high and low for a source, ordered myself a rhizome, planted it out last fall (and a few others of course), and finally this spring got to compare the named one to my own. I think it’s a match. 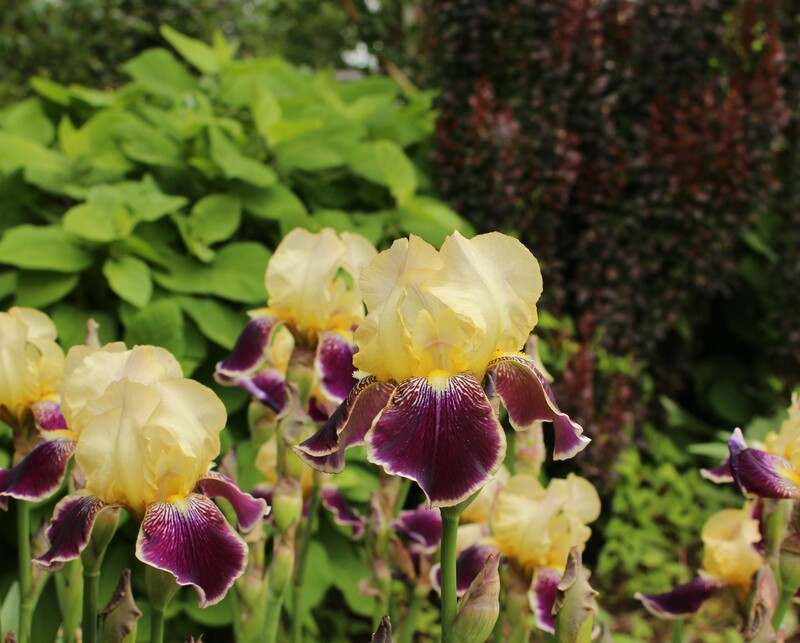 Iris ‘Folkwang’ on the right and a flower of my unknown to the left. So maybe naming an unknown iris does border on the obsessive, but in the grand scheme of things it’s nothing when compared to how much time I spent this week planting dahlias and cannas and getting a garden ready for the whole half dozen people who might notice… yet again I digress. It’s iris season, it must be enjoyed. Iris ‘rhages’ looking a little pale this year. Usually the flowers show much more spotting, but it’s still a beauty. There are a decent amount of iris around the garden but to be honest I think I could use a few more. 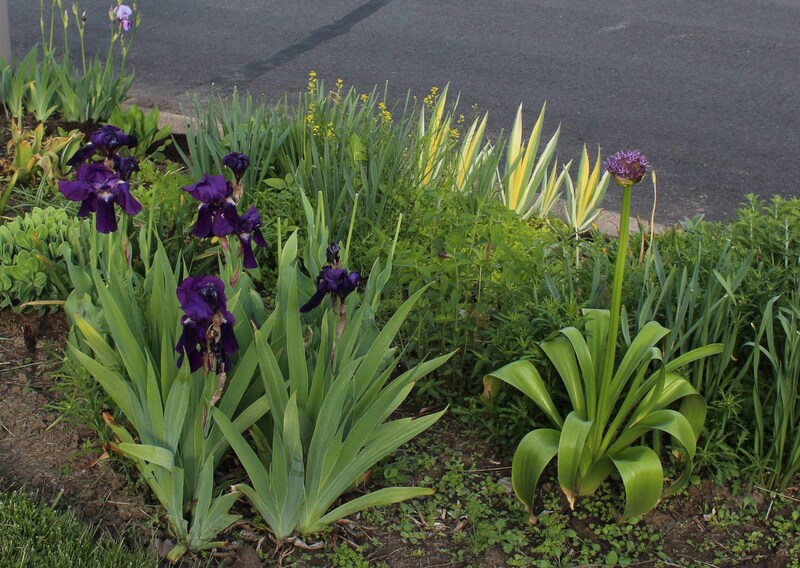 In past years I spread iris ‘Rhages’ to the other side of the driveway, and they’re now the more impressive clumps compared to the little batch I have growing next to the mailbox. I am trying and trying so hard not to give in to the temptations of the newer, bigger, flouncier bearded iris. They’re so much more of everything, but I just don’t find them as carefree and reliable as the older sorts, and in my garden once the pool and lawn chair start calling I need a certain amount of carefree. An unknown modern iris which a friend forced onto me. I couldn’t just let it die so in an out of the way corner of the garden it flowers and offends only me. 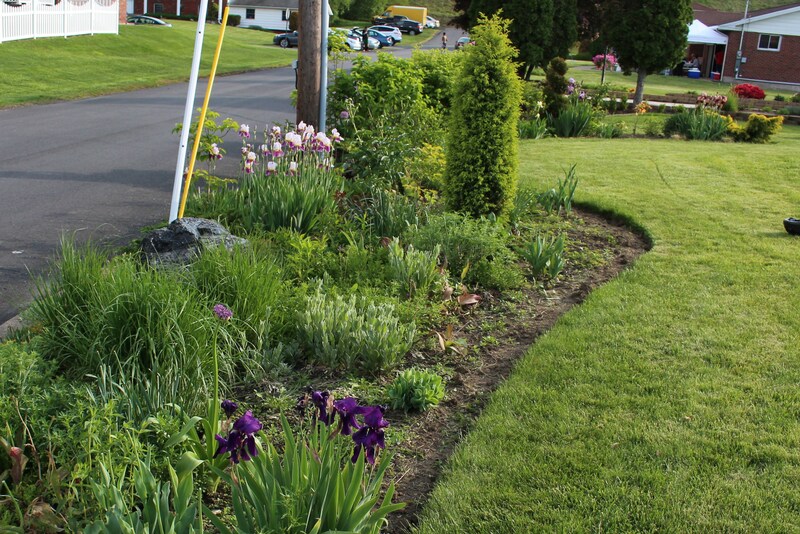 I’m trying to decide which other iris I should add to the front street border. Should I stick with the blue tones or just throw everything out there? I go back and forth between love and boredom on the mustardy reds of iris ‘Picador’. 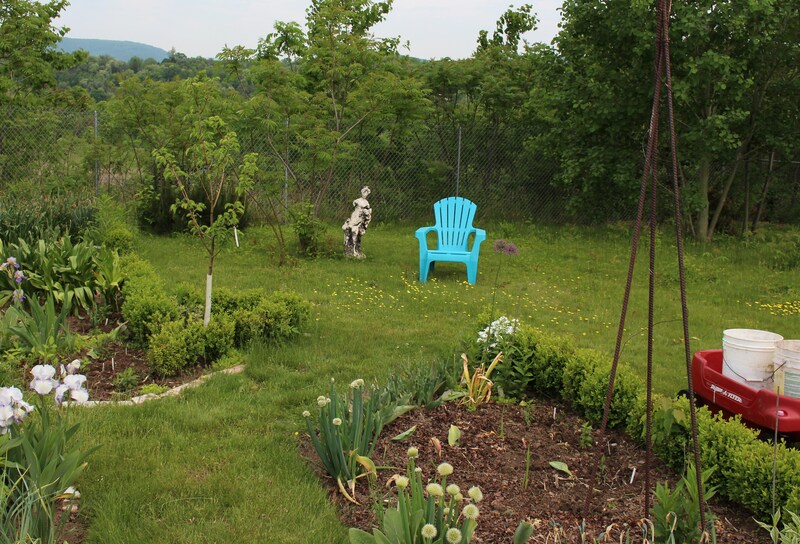 I’m just not sure if this color will work out front so in the meantime it stays out back near the meadow. I might have to make an exception for a cousin of my newly named ‘Folkwang’. 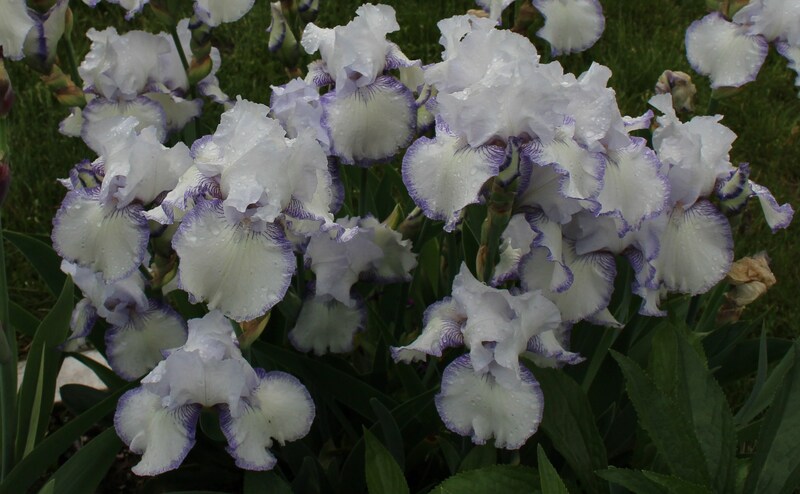 Iris ‘Vingolf’ is also a product of the breeding program of Goos & Koenemann and was introduced a year earlier in 1924. I’m sure I could fit a clump of these out front. Iris ‘Vingolf’. 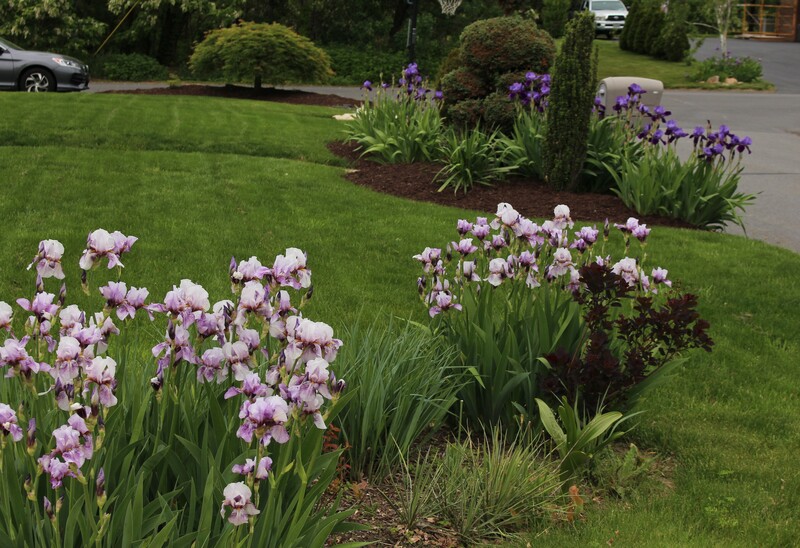 A shorter stouter iris, perfect for along the edge of the bed where the foliage will pick up once the flowers fade. 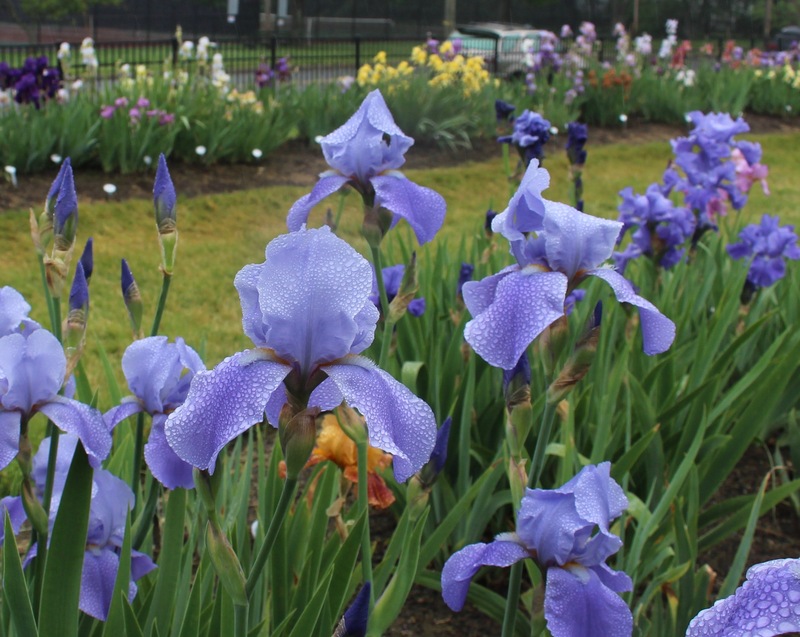 In this dry and sunny bed the foliage of these historic iris usually holds up well and looks decent throughout most of the summer. It reminds me that with all this focus on grass trimming, canna planting, and Tuesday views, I’ve missed another monthly focus on foliage with Christina at Creating My Own Garden of the Hesperides so I’ll try and sneak that mention in as well. Here’s a bed across the lawn from the street border, it’s highlight are a few lusty verbascum ‘Governor Aiken’ seedlings which appeared last year and were just too healthy to pull. Verbascum and a whole bunch of other things looking Maytime fresh. The ‘Tiger Eye’ sumac suckers look so innocent right now and of course there are more iris, variegated this time. So there it is, the Tuesday view and a few other things all still posted on the appropriate day… assuming you are visiting from the Atlantic time zone… I suggest you take a look at Words and Herbs and see what others around the world are seeing this week. Maybe it’s iris season there as well and I can’t help but say that’s a good thing. 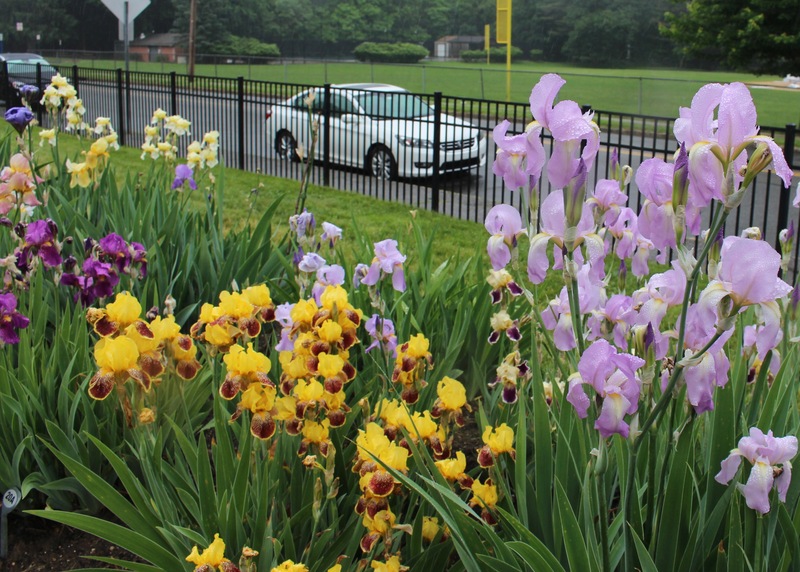 Iris season is in full force here and although I’d rather report back that projects are getting done and plants are getting planted, they’re not. I spend a considerable amount of time relaxing in a shady spot just enjoying spring. I like to think we deserve it after last winter, but things would probably be the same had it been warm and rainy all February. While I continue my hard labour in the vegetable patch, digging and prepping planting beds, I worry that bearded iris might make a play towards taking over more broccoli acreage. They grow so well there and the open spots would look so much nicer blooming blue instead of pushing out another potato. 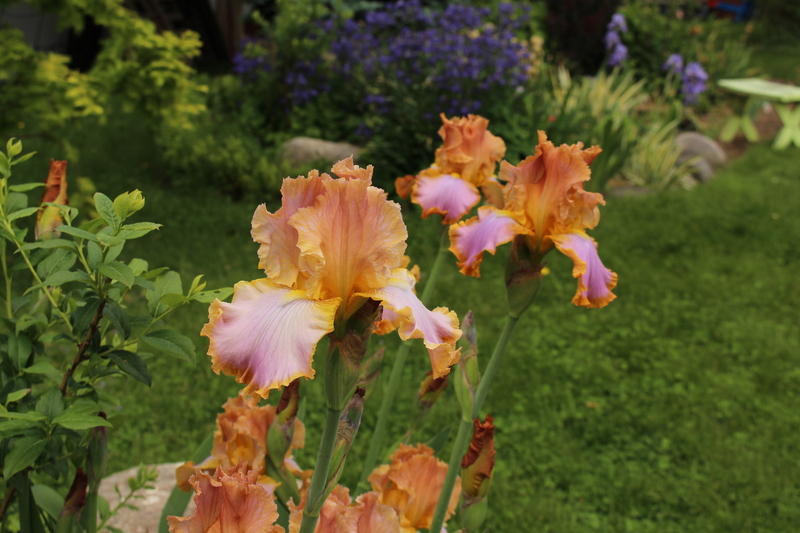 Bearded iris “snowbrook” putting on a beautiful show… but lacking something….. maybe it’s just a little too short and congested to have all the grace I expect from my iris plantings. One iris which will stay on the edges of the vegetable beds for a few more years yet is the bearded iris “ominous stranger”. It’s not the heaviest bloomer, it doesn’t show up well amongst the brighter colors, but it does have a graceful subtlety which calls for closer inspection. 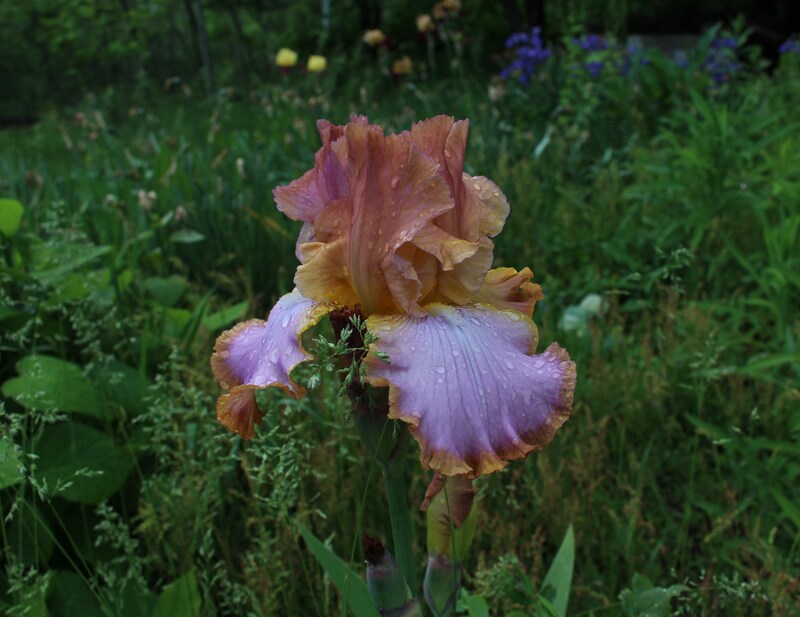 I need to stay away from the ruffly, overblown, modern bearded iris. I could loose the entire vegetable patch if I start dabbling in these. This is iris “ominous stranger”. 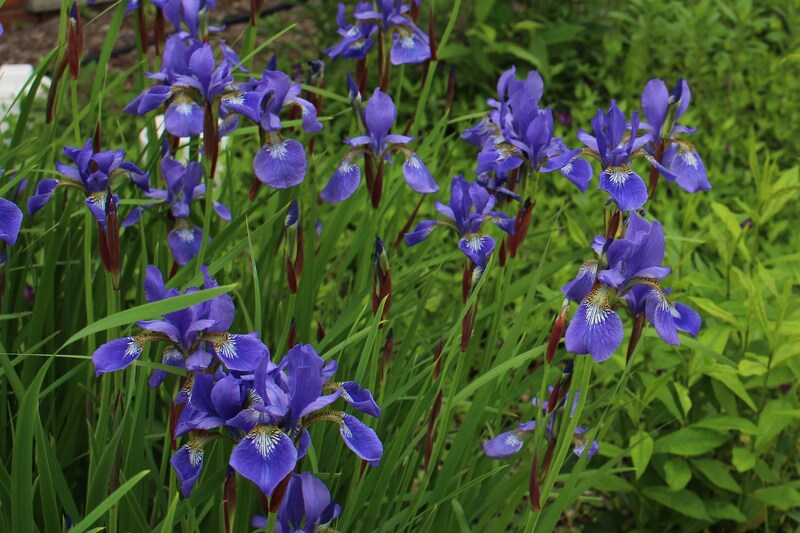 I did try to start a dedicated iris bed when deck building displaced some of the old patch, but it’s at an end of the garden where a mulching mistake resulted in too many seedlings of little bluestem prairie grass. Grass seedlings and an iris bed don’t mix well, and then throw in a little giving-up and you’ve just added another project on to the to-do list. Still it’s impressive to see which iris continue to thrive amongst the neglect. Iris “honorabile” carrying on in spite of the uninvited grass and blue columbines which have moved in next door. A clump of the late blooming daffodil “baby boomer” also needs an escape plan from this bed. 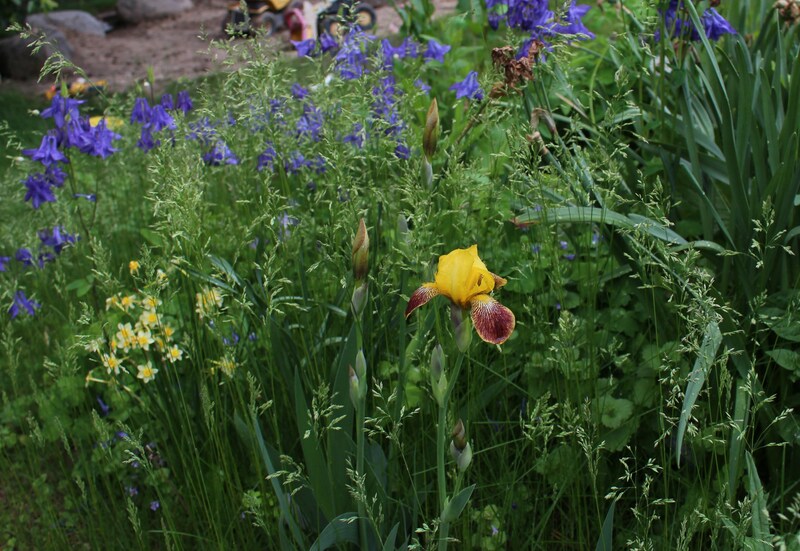 My favorite this week in the weed bed is this sport of iris “honorabile” called “darius”. Just one little genetic oops happens and the tint of the falls changes from maroon to more of a violet purple? (please forgive my lack of any color accuracy beyond red and blue). 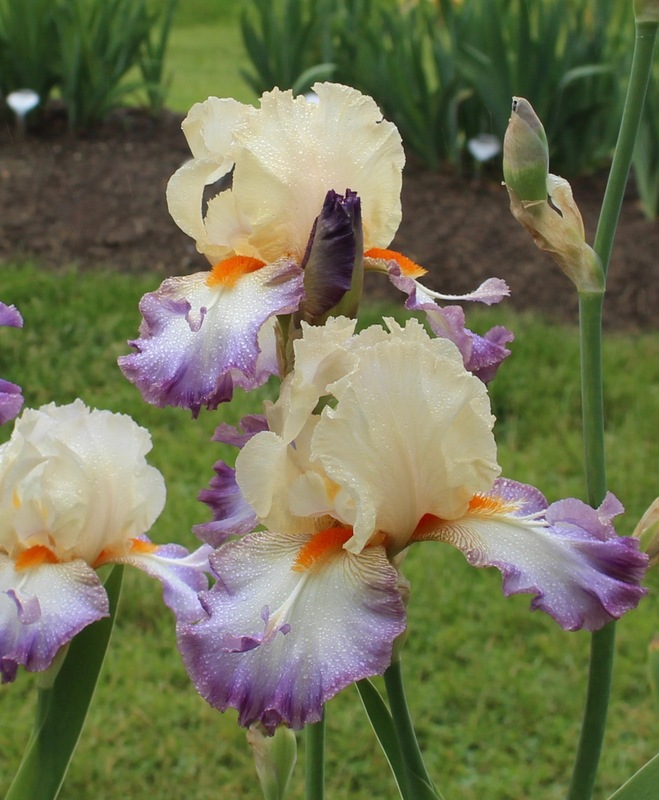 Historic iris “darius”, a sport of honorabile with a nice blend of yellow-lemon-purple(?) on small graceful plants. Here’s another impossible-for-me-to-describe color. An unknown modern iris is doing quite well in the weed bed, throwing up a healthy stalk of some ruffled murky unknown blend of pink. Idleness and plant neglect seems to be a theme this week, so I might as well stick with it. This unknown historic was traded to me and to date hadn’t bloomed. Last summer while debating a spot to replant it in I set it down between some tomatoes and succeeded in ignoring it for the entire growing season. Maybe it got scared, maybe it enjoyed the company of tomatoes, either way it finally sent up a stalk of these nicely patterned blooms. Guilt is sometimes a good enough reason to keep a plant. 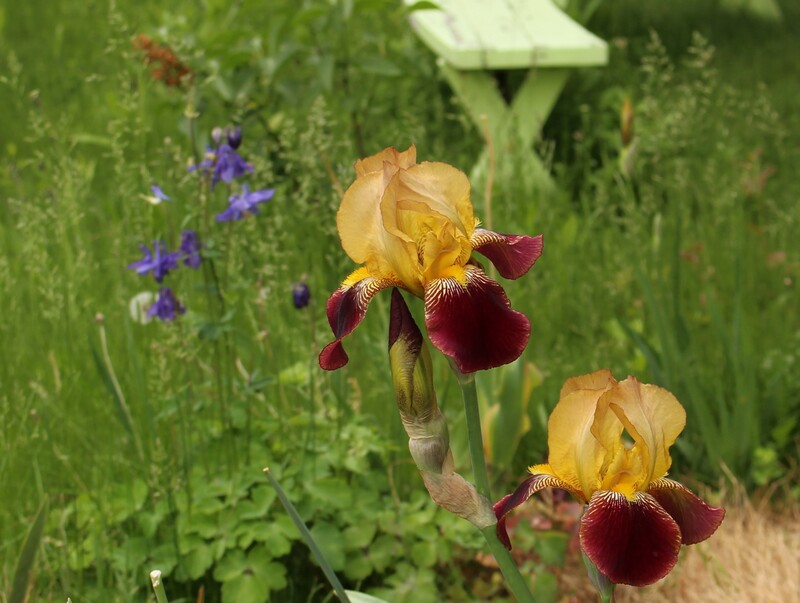 This unknown iris will stay just because of the abuse it’s endured…. that and I like the veined falls… it just can’t stand next to one of the fancy modern iris or it will be completely ignored. 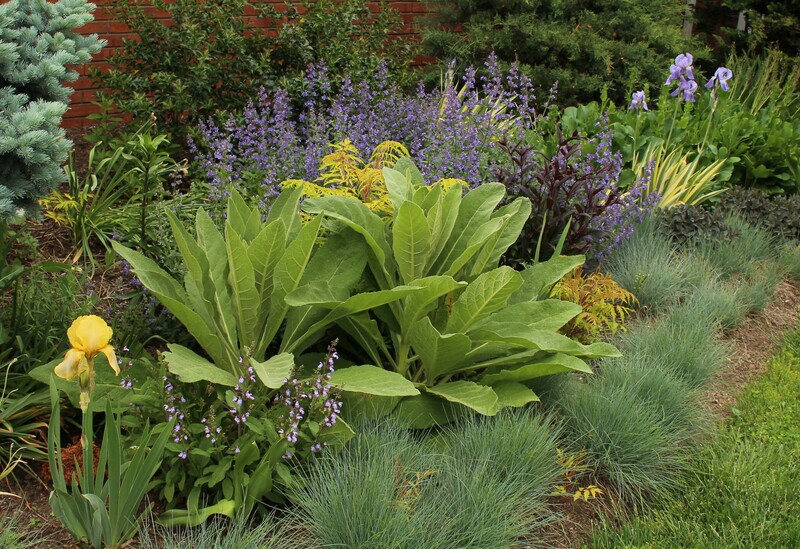 There’s plenty to enjoy in the garden as it turns the page into summer and June. The first rose opened today and the sun is shining bright, but I spend way to much time overseeing things from a seated position. The queen of the prairie and I sit in the shade of weedy sumacs and contemplate things. I would claim big plans for today, but it’s Sunday, and the day of rest must be observed. Spring goes by way too fast to begin with so in my book there’s nothing wrong with trying to enjoy every minute of every beautiful day. Here in the US it’s Memorial Day, a day of parades and ceremonies to remember the sacrifices of the fallen. Today we’ll be hitting the main events but we’ll also be grilling and getting ready for summer since the weather is finally agreeing with the calendar. Yesterday I finally got to spend a lot of time in my own garden and most of it was spent getting the front yard straightened out. 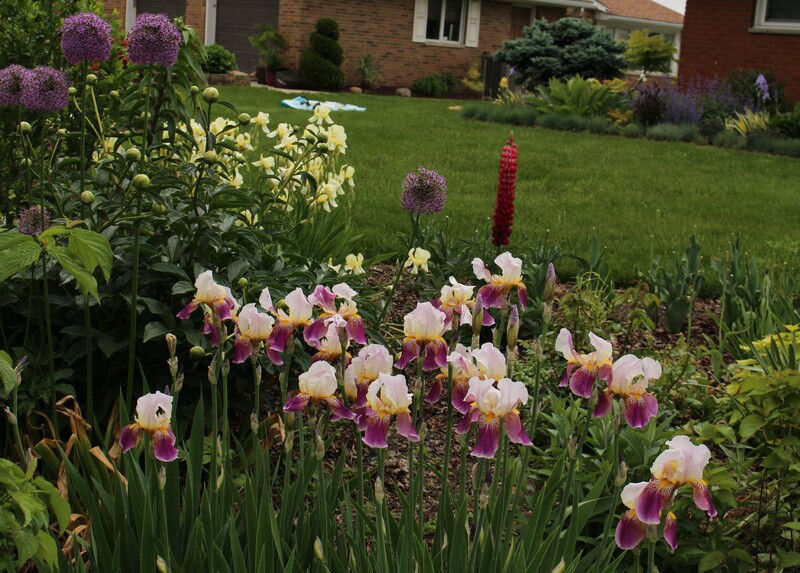 It was a pleasure since the whole yard is perfumed right now with the lemony and grape scents of flowering bearded iris. 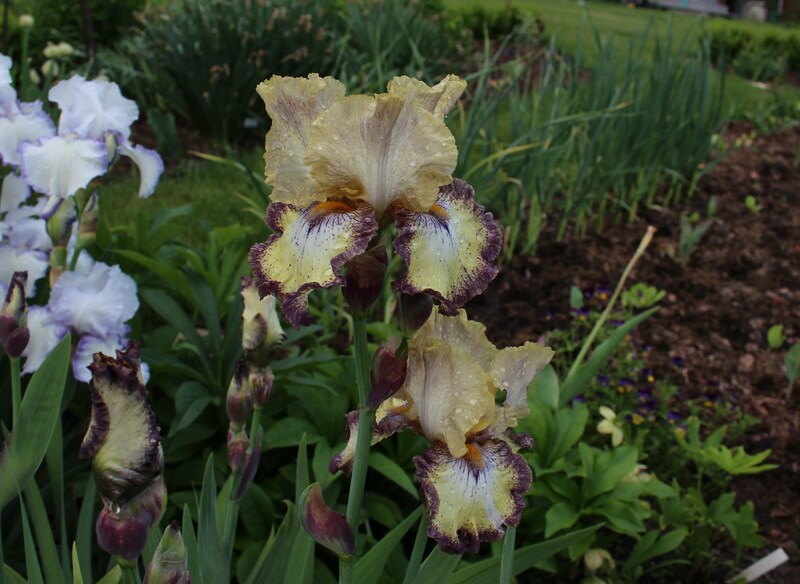 This old iris is one of my favorites. Although nameless, it has a strong fragrance and carefree habit. 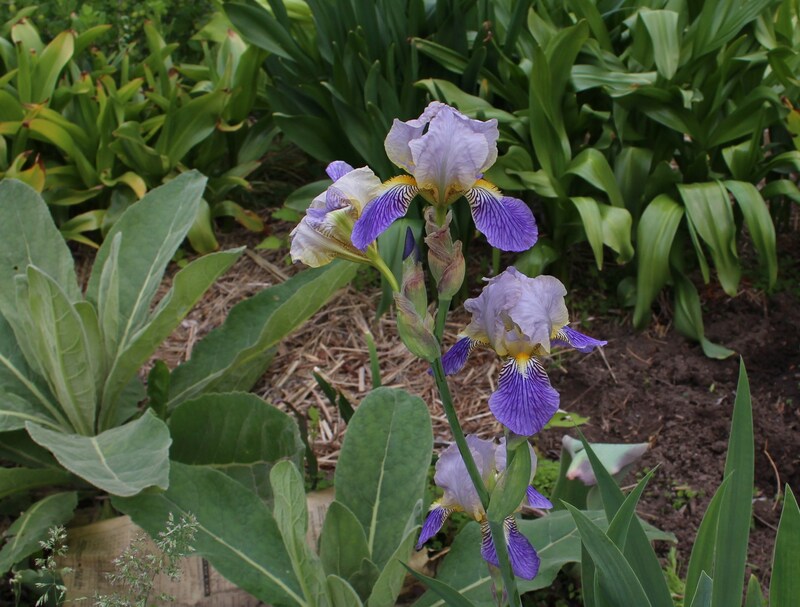 Butterfly bush will shade the entire patch come July, but these iris keep going regardless. 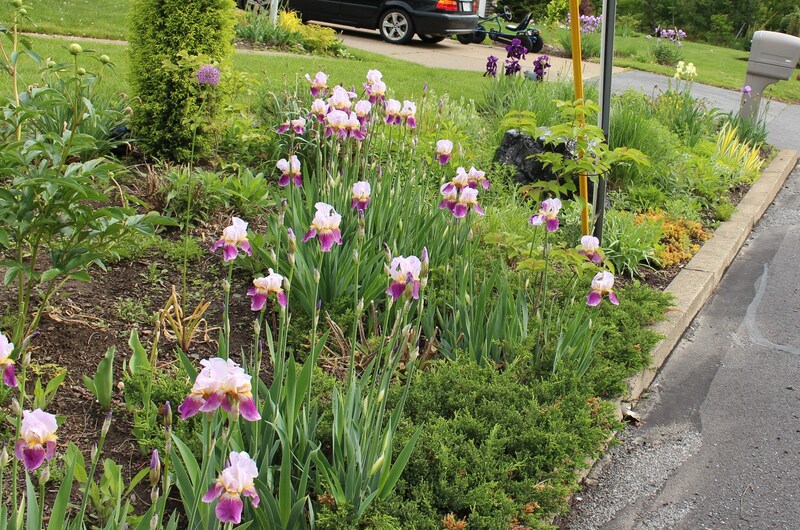 The front border along the street is dry full sun, and the iris enjoy the summertime baking. 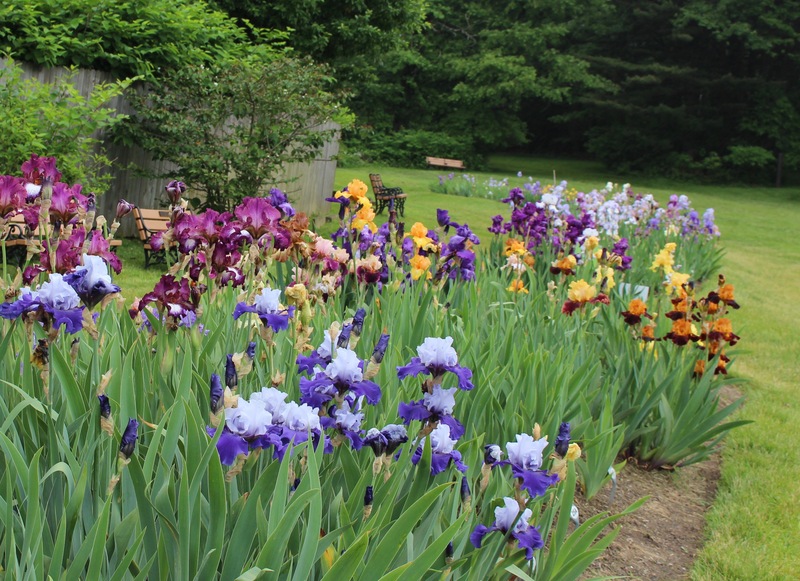 I think the dry, lean life helps ward off all the floppiness and fungal diseases that sometimes becomes a problem with bearded iris. Iris “Indian Chief” is also an older nearly indestructible iris. I sometimes think of these as cemetery iris since they seem to go on indefinitely, lovingly planted by a gravestone and then neglected for the next 50 years. 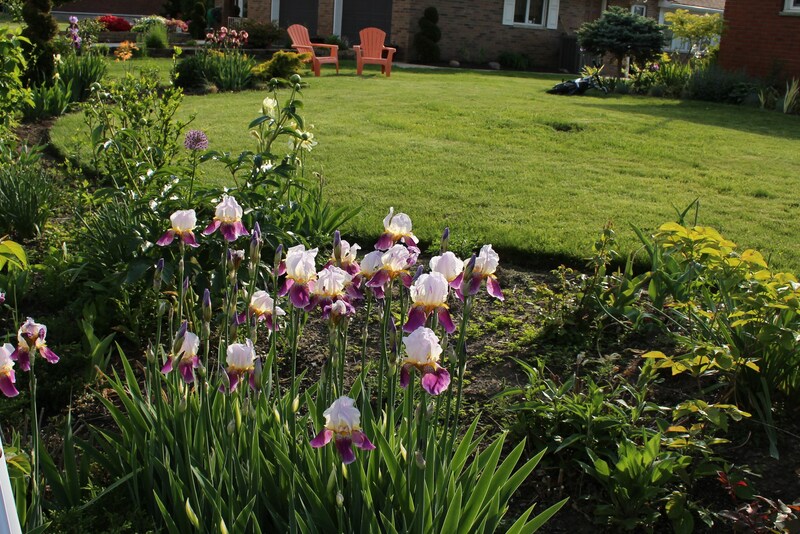 The iris are a little sparse this year compared to years gone by. I pulled out wheelbarrows full last summer to try and thin things out, so it will be another year before some of the new clumps really fill in. Sometimes the garden needs some tough-love 🙂 They were the perfect plant for this location though, and really helped make a new border look full and settled in within the second year. Iris “rhages”, another historic iris from the 1920’s. Approaching its 100 year mark and still a pleasure! I did some moving and dividing but this bed will need some serious weeding once I can sort out what all the seedlings are. Drought last year kept all the biennials and perennials from sprouting last fall, so the real estate was open for tons of nicotina, verbena, and rudbeckia seedlings. Something about the winter was perfect for seed sprouting since I have things coming up that normally don’t- such as sedum seedlings- and few of the usual characters such as oxeye daisies and forget me nots. Iris kochii, a bearded iris collected from the wilds of northern Italy around 1887, and my allium splurge coming on next to it. I finally broke down and shelled out the $7 for this bulb and now I’m looking forward to the softball sized blooms. A firm hand (and a shovel) were used against all the little guys drifting down towards the street. The border may get a bit unruly but I used some leftover mulch to give it a clean edge. 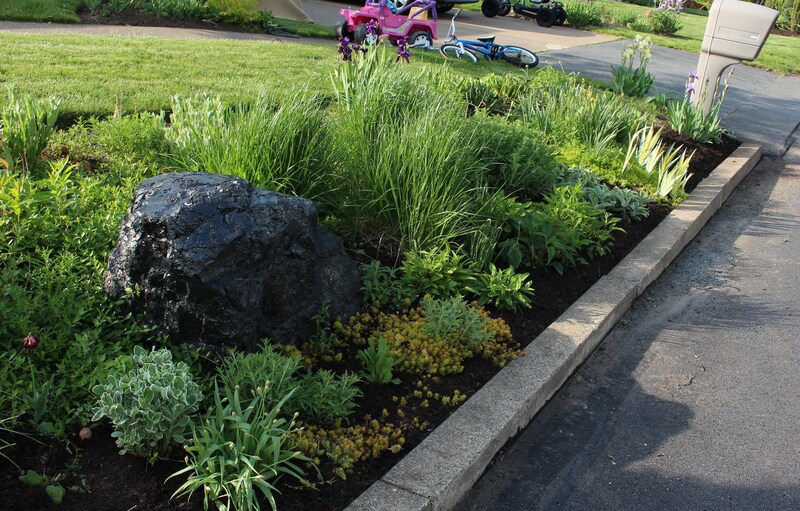 Although I’m not a fan of the brown dyed mulch (it was free from next door) it gives a nice neat edge and might be the easiest thing you can do to make an “overly exuberant” planting look controlled. A foot or two of fresh mulch along the edge even makes the weeds look better. -yes, that’s a big chunk of coal… this part of Pennsylvania is coal country and we actually sit right above one of the mines. 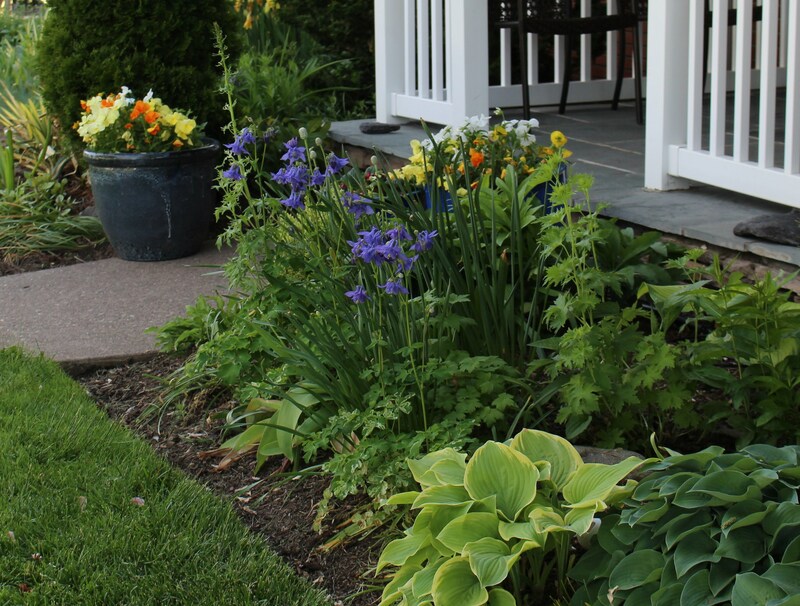 The border along the house also got a little attention, but overall there’s not much to do here. Hostas have covered up and filled in around the early bulb foliage and the columbine seed I threw around last year has grown up and added some nice blue color. In another few weeks I’ll come along and get some annuals in, probably some of the coleus cuttings off the windowsill. Blue aquilegia filling in until the annuals get planted. With warmer weather coming the pansy’s days are numbered. I was a little firmer with the sunflower seedlings this year. Dozens came up (apparently all the seeds weren’t eaten by the goldfinches) but I moved all but a few to the tropical garden… which has now become a sunflower field. A few are left though, and the neighbors will just have to deal with rank eight foot annuals mixed in with the foundation plantings. 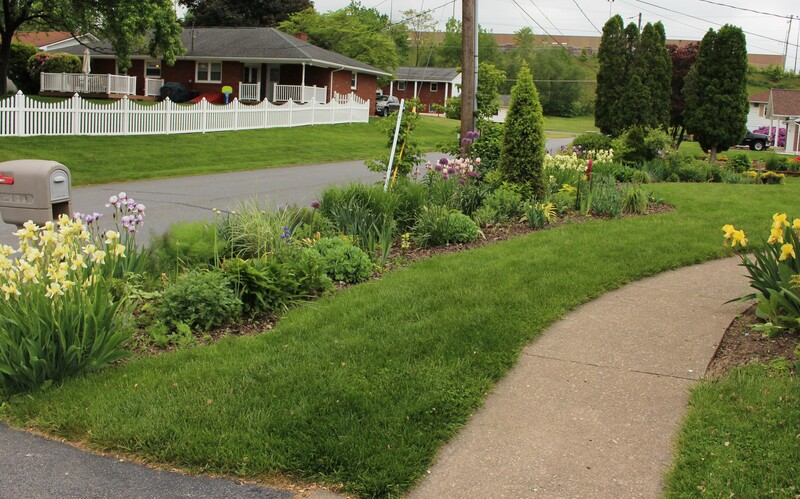 Here’s another questionable front yard planting. Miss Willmott’s Ghost (eryngium giganteum) is a slightly weedy looking, thistle-like biennial that is just starting to put up its bloom stalks. This is my first year with it (the seedlings didn’t do much last summer) but I already love it. Just look at those flawless leaves with that nice veining! The striped leaves of iris pallida “variegata” with blue fescue and Miss Wilmott’s Ghost. I’m all into the ghost right now, but the iris deserves some more respect too. I should really give it a spot of its own, and not just these stray bits that were missed when digging the bed over. I hope to give the vegetable garden a little attention today. 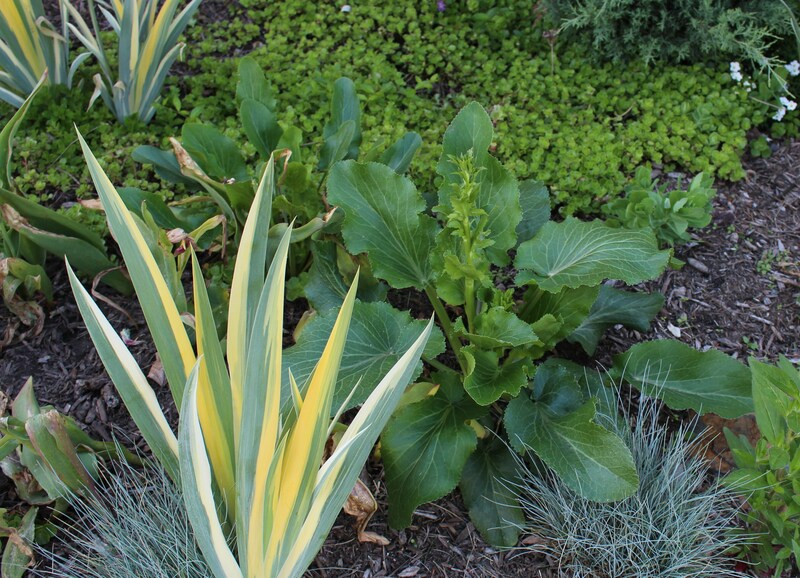 It’s overrun with weeds at a time of year when it should be brimming with harvestable lettuce. Oh well, we have to pick our battles at this time of year, so I’ll just focus on the front with its neatly edged lawn and freshly cut grass. How do those stupid chairs keep showing up in every picture?! Such are the problems of almost-summer! Using the term history around here is a bit of a stretch. History to me means centuries, not the fifty or so years that have passed since our house was built. Fifty puts us into the outdated category as far as baby blue bathroom themes go, but it doesn’t exactly put us on the historical register. The garden is even younger. Fifty years ago five trees were planted, they did well but four were removed just before we bought the place…. and for fifty years the lawn was mown. So I guess we have one pink dogwood, antique grass and not much else. Since I can’t afford timeless stone walks and weathered brick walls I settle for the history behind plants. In my opinion plants with a story behind them are worth growing just for that. Passalong plants are those which are passed on from gardener to gardener and generation to generation. “My grandmother gave it to me” vs “I bought it at Home Depot” I guess. 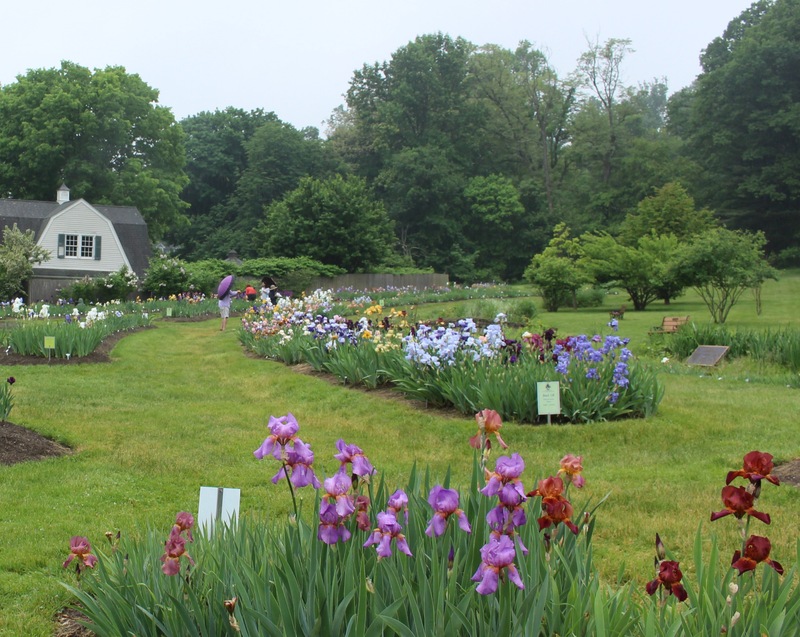 Iris pass on easy, and some of the historic iris even followed the settlers west as they looked for familiar plants to fill their farmyard gardens. Maybe that’s what I was thinking when I brought these up from the old garden to plant out by the street. The pale yellow is “flavescens” which dates to 1813 and is indestructible. Mine comes from the side of a highway and survives drought, mowing, weeds, salt…. but does much better in the garden. Sometimes it gets beaten down by relentless gale strength winds (such as we had last weekend) but it always blooms, blooms long, and keeps decent foliage all season. The other iris, a mauve/violet with white standards (the top part) is from my mother’s garden. It’s been there since they bought the house 40ish years ago and is a favorite. 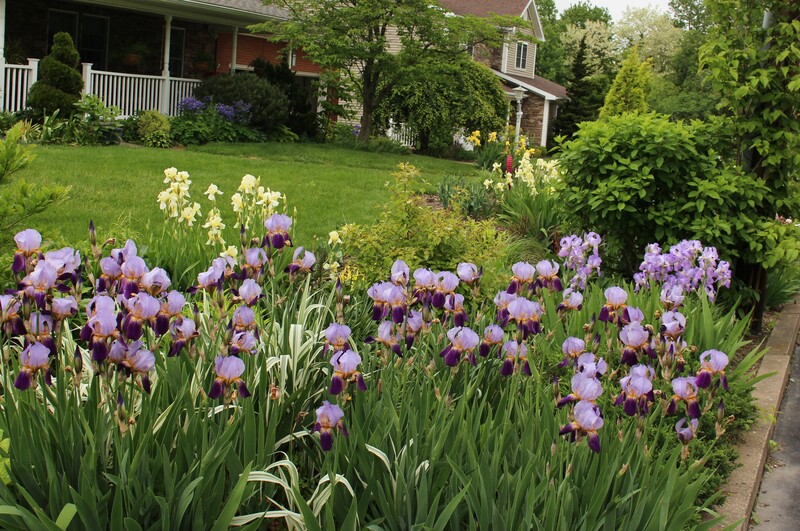 Like many historic iris it has a strong grape scent which fills the yard (you can see the windblown flavescens in the background). “Indian Chief” 1929, was given to me by a friend and is also out there. It’s a well-known historic and shows up in cemeteries around here frequently since it welcomes neglect. 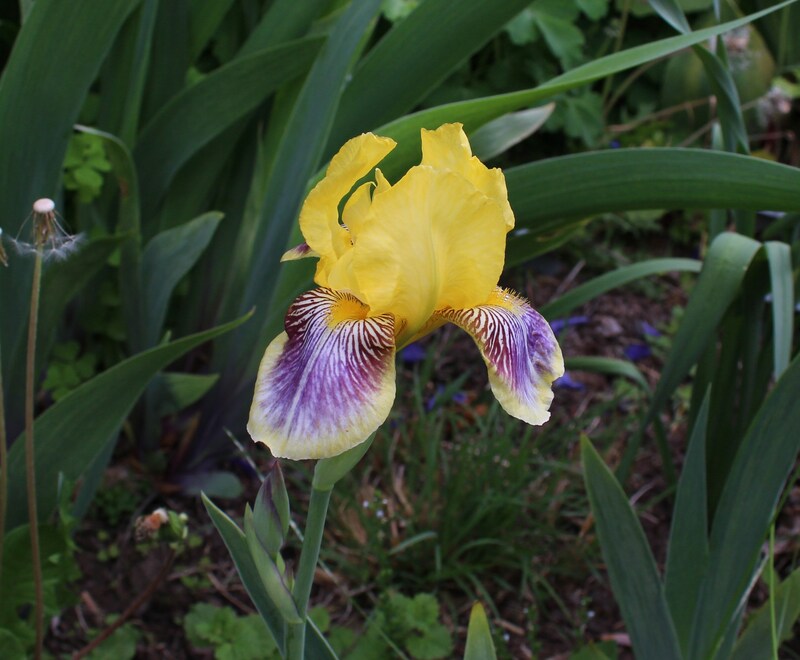 I sometimes find the darker ‘smokier?’ colored iris hard to show off in the garden and this is one of them. If anyone has any suggestions on combining them I’d love to hear it. “Color Carnival” 1949 is not a favorite of everyone. I would describe it as a fleshy pink with purple veins and a tangerine beard. My descriptions don’t always match the catalogs. This batch came up when I used some not completely done compost in this bed. A year of composting and the roots still made a comeback, not bad. I got this iris as a kid. It was growing in our neighbor’s yard against the wood fence. Rather than outright ask for a bit I patiently pried apart the boards enough so that a single fan could grow through. A year it did and at that point I felt comfortable digging it up and calling it my own. It’s been following me around ever since. “Rhages” 1934 was purchased. No story. It’s reliable and I like the speckling. 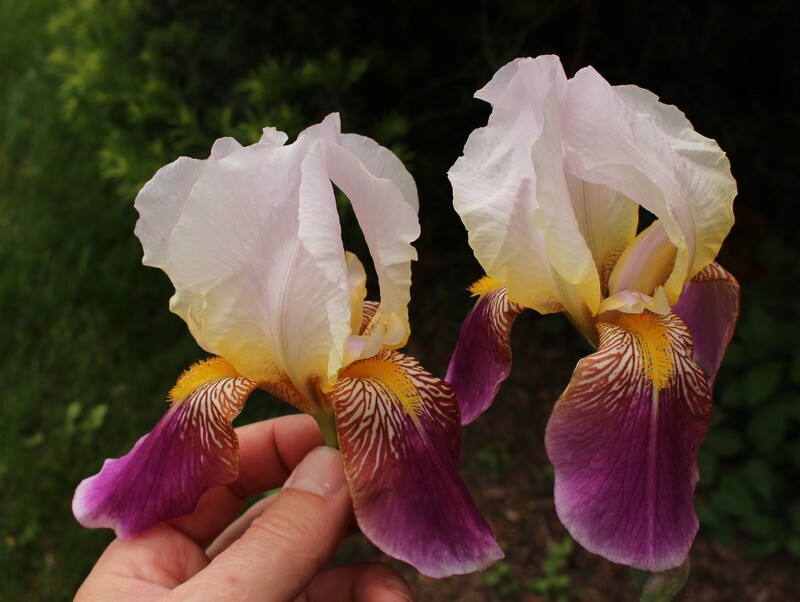 In iris talk the speckling around the petal edges is called plicata, sounds fancier that way. Of course iris do blues best of all. This no ID comes from the same highway roadside as flavescens and is just as hardy. 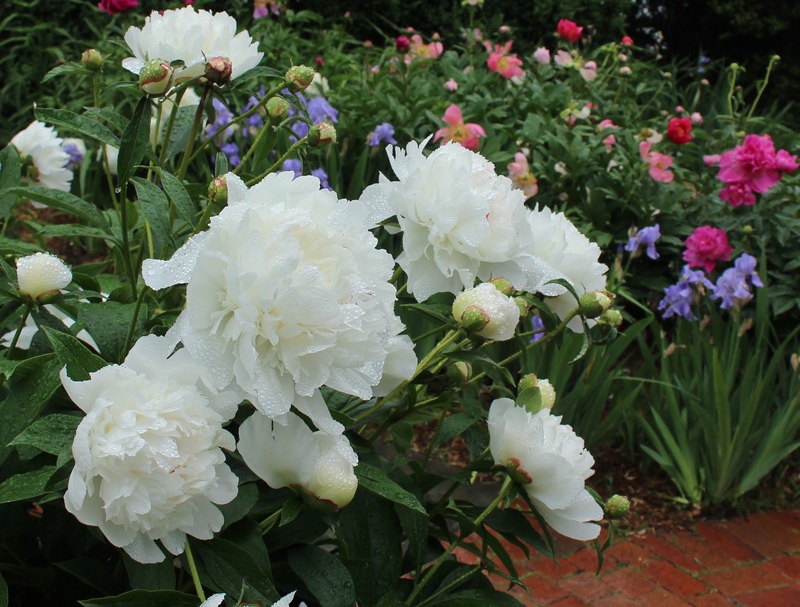 Flowers aren’t too big or too ruffled or too deeply colored, they’re just clear and elegant. I guess that’s plenty of iris. One last one is “Mme Chobaut” 1916 it’s growing out back in the meadow and could use a decent home. Maybe this year. 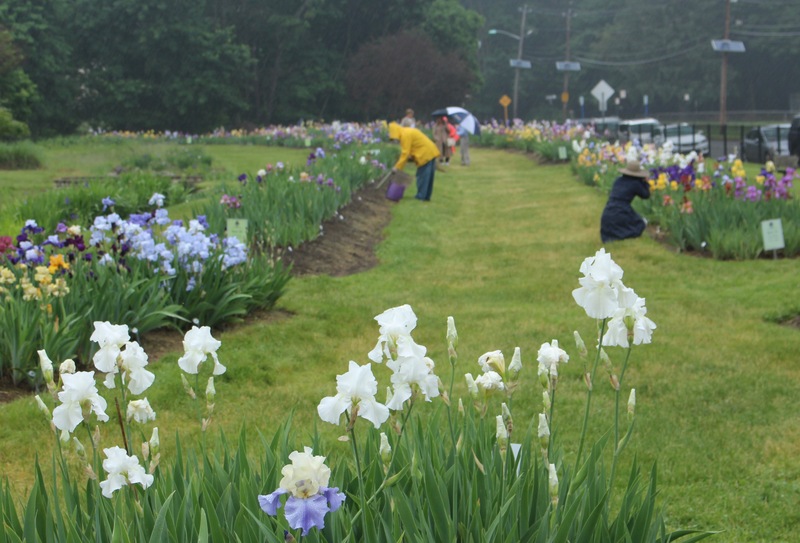 In case you’re interested in older iris there’s HIPS, the historic iris preservation society. 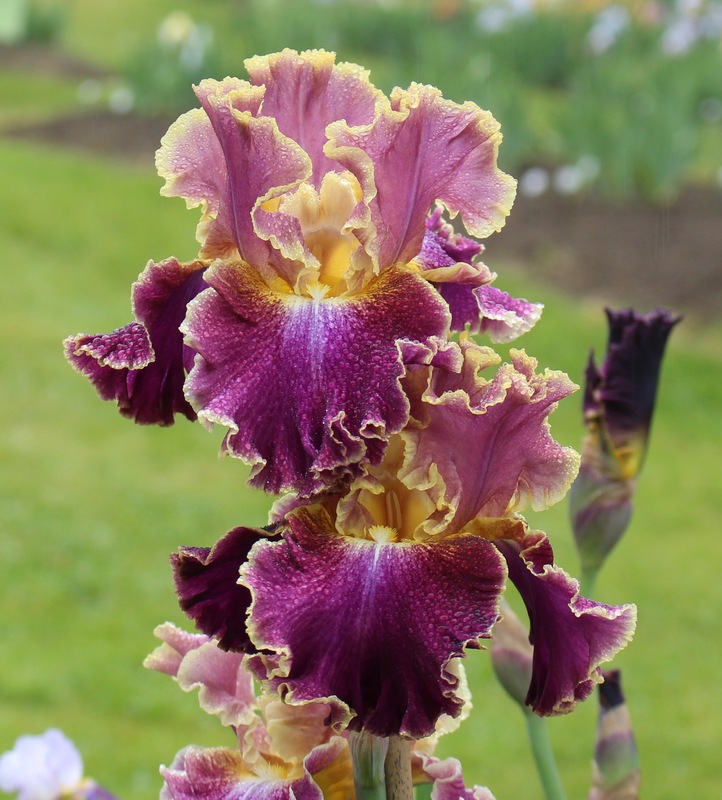 It’s a great resource for info and for getting in touch with other old-iris lovers. 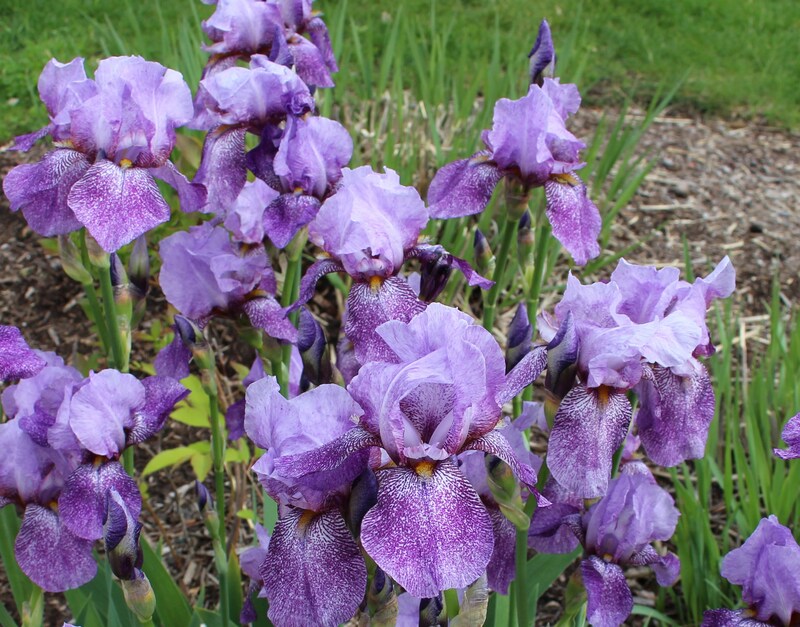 Members have an iris database to browse and a forum to post to. There’s also an annual sale and quarterly magazine. 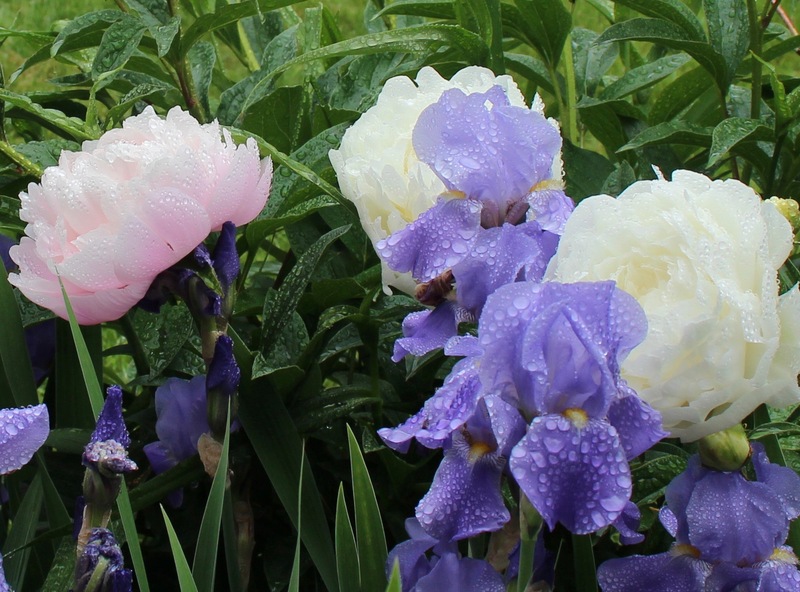 I could easily be convinced to grow more of the modern iris, some of them are just amazing in their ruffled fluffery and colors, but I resist. For now I’ll stick with the tried and true. Plus this year the late freeze has killed most of their blooms. Here’s an iris traded to me as “mesmerizer”, but it’s not. Maybe it’s “Nordica”, another white but with orange beards. The one bloom looks ok but the other is stunted. The freeze also damaged leaves and killed off most of the other stalks. Such is gardening. It’s like baseball, there’s always next year…. even though you hate to lose.